Big fines have been proposed as a way to get people to obey crosswalk and traffic laws. LIKE everyone else who travels on Hawaii's roads, Gov. Linda Lingle has seen incidents in which poor judgment leads people on foot and behind the wheel into dangerous situations. Even without witnessing the jaywalkers she described in testimony to lawmakers this week, the governor is well aware -- as everyone should be -- that streets and highways across the state have increasingly become high-risk zones. The governor testified in favor of House Bill 375, which would raise fines for drivers and pedestrians who defy crosswalk and traffic laws, a measure that should be approved. If money talks, then fines ranging from $150 to $1,000 should shout loudly enough for scofflaws to hear. 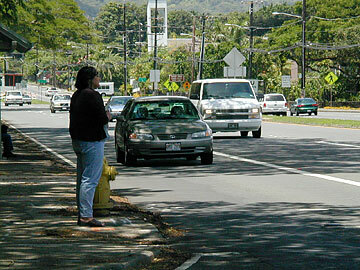 A pedestrian waits for a break in traffic to cross the Pali Highway. But no matter how many laws are on the books, none can match responsible action for curbing the escalating number of traffic fatalities and injuries. The din raised both by drivers who complain that pedestrians are at fault and by pedestrians who grumble about reckless drivers would be quieted if individuals would simply take more heed of others. Twelve pedestrians have been killed on Oahu streets so far this year; a total of 21 lives have been lost in all traffic accidents. While that's just five more than at the same time last year, the numbers do not tally the pain and suffering that ripple from them. Parents lose children, wives their husbands, friends their confidants, all because a driver or pedestrian was too impatient to wait for the next light, inattentively chatting on a cell phone or obliviously connected to an iPod instead of to the surrounding world. Those who disregard common sense also are disregarding the safety of their fellow humans. It's this "me first" attitude that allows the moped driver to skirt around a line of cars to get up front, that grants a walker license to dart across an intersection just before a light change, that sanctions a motorist's jumping the green. The possibility that flouting traffic laws will cut a healthy chunk from a checking account might be sufficient reason for a careless citizen to reconsider, but the most effective way to reduce the wreckage on Hawaii's roads would be for people to take responsibility.